This auto focus circular fisheye lens has an angle of view of 180 degrees in all directions. It is exclusively designed for digital SLR cameras with the APS-C size image sensor. 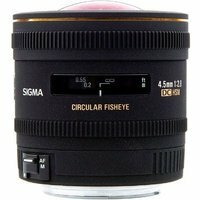 When used in conjunction with digital SLRs with APS-C size image sensors, it produces circular fisheye image within the frame. The fast f/2.8 maximum aperture produces a bright image in the viewfinder making this lens ideal for low light photography. It is equipped with an internal focusing system that creates high definition and excellent image quality over the whole frame. The HSM (Hyper Sonic Motor) ensures fast and quiet auto-focusing and allows full-time manual focus override by rotation of the focus ring.